I took this photo on my way home from work the other day. I just couldn't resist. So, I quickly checked my mirrors to make sure no traffic was coming, and I pulled over to talk to a calf (and take photos too, of course). 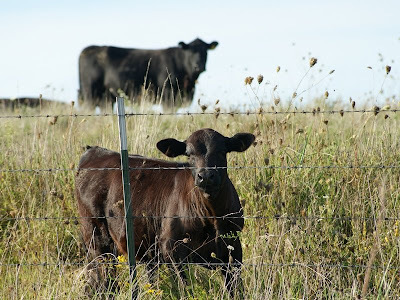 This calf was very interested in me and didn't mind posing for some shots. As you can see, though, Mama is keeping a close watch over her baby. Hmmmm, maybe I should make her some prints to hand out to all her cow friends and family. Yeah, that would be amoosing (geesh, I need more sleep). THIS little critter is my baby. She was born to a mama who wouldn't claim her and take care of her. So, she tried nursing off of someone else. That someone else didn't appreciate that too much, and roughed up my poor little girl. So, now, she lives in one of our buildings and comes running for her bottle twice a day. She's being shy with the camera. I told her that if she's going to be "MY Baby", she's just going to have to get used to the camera and posing for lots of photos. At first, she still refused. I guess she doesn't want to be a famous blog-calf. "Wait! Did you say bottle???" "Wellllll now, in that case, by all means, take my photo!" How can you resist that face? And those gorgeous long eyelashes??? She just bats those beautiful eyelashes at me, and I'm smitten and ready to get some new patio furniture covers and sit outside with her all day answering to her every whim. It sure didn't take long for her to become spoiled. By the way, this little girl doesn't have a name yet. 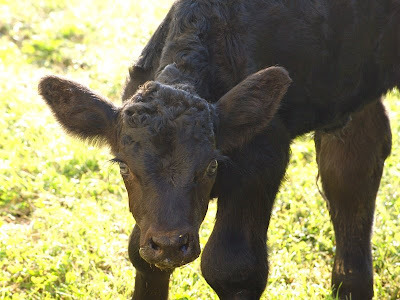 I was calling her "Curly", because of her curly hair on her head and back, but Hubs informed me that he already calls another calf "Curly"... Shall we play "Name This Calf"? My that sure is an adorable baby you have there. I bet it is fun giving her the bottle.I would love to see some pictures of that. Now you can indulge yourself with that feeding bottle. She looks very sweet - the wife will melt. She's adorable! I'm sorry she got roughed up tho. Good thing she has you! How about Shirley? As in Shirley Temple since she has the curls? I love the calf, and "your baby" too. I guess her mama knew she was the black sheep of the family. Yes, Mist, I would have puled over too, to take those shots. Great Sky Watch colours, too. Awwww she is beautiful! I would have stopped too. Hey! I did stop tonight - for a load of cows crossing the road from one field to another! Not great shots because I was about 8th in the queue, but I got some. Not downloaded yet. I love these shots of yours though. If not curly, how about Mo? I'm a smitten kitten for those lashes. Just the cutest! I love calfs. They are just like dogs. They are loyal and follow you around. SO cute. Your photos made me miss the time I lived on a farm less. Thanks. 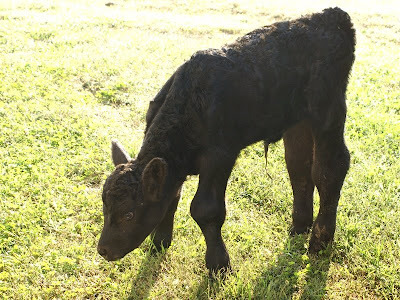 lucky you have a calf, all yours. this is a totally mooerific post of mootiful cows. Ok I should stop! Name the cow game! How about cowpernicus? Now I went from bad to worse, but I loved your post nonetheless! Your cows are so photogenic! 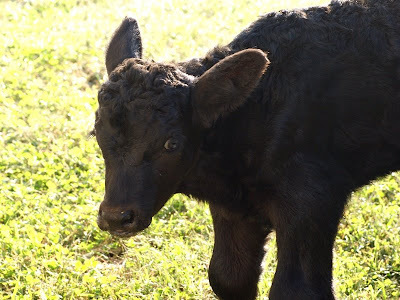 you just made her/him a world famous blog-calf, misty! as usual, great shots, great posts! "Misty's Moosings?!" Lol! 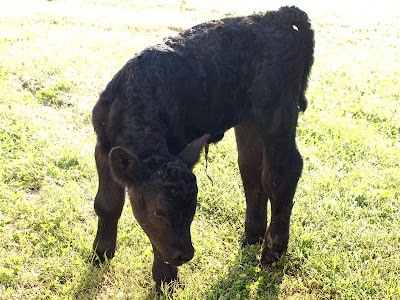 (laughs and slaps her knee in merriment) Your little calf is absolutely adorable. I agree with Bubba's Sis... Curly Shirley would be a great name for your little cutie! 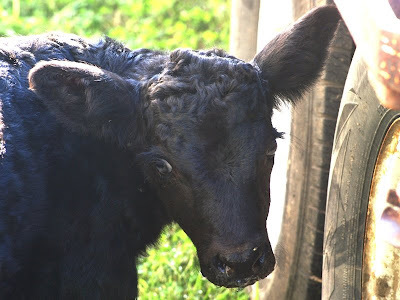 Oh nothing is cuter then a baby calf, and look at all that curly hair. Misty: What a neat post about your little cow with great photos. You have to go and read this post. It will really make you laugh. Hope you are doing well, I golfed on Saturday so I was really off on my posting and visiting. She is a doll baby! I want one!